I do the best I can not to have any preconceptions before testing a car. I don’t generally read anything about it, I don’t check out the website, brochures or press releases. I’ve been let down too many times, expecting a car to be good, and it turns out to be at best a let-down, or at worst – rubbish. There have been a few. The Chery J11 springs to mind. We tested it in 2015 and before driving it I felt that surely by then, Chinese-built cars would be really good (spoiler alert – it wasn’t). Others I have had low expectations of, and have blown me away, like the $15K 2-cylinder Fiat Panda. I still want to buy one. 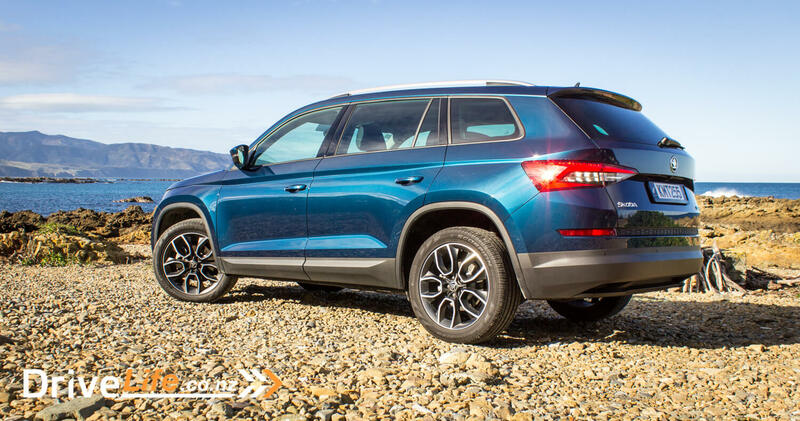 So to the Kodiaq, Skoda’s first-ever full-size SUV; hyped up in advertising by Skoda New Zealand, winner of a million awards (well, it feels like it) and here it is; a 7-seater, full-size Euro SUV for under forty grand? 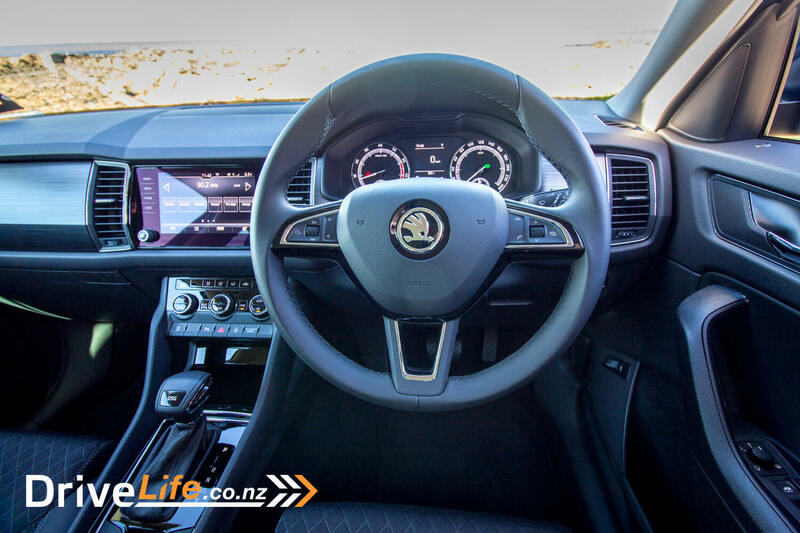 Skoda offered DriveLife the base $39,995 FWD Ambition version, or the $58,290 AWD top-spec Style version. We chose the base model; if you are going to hype your advertising up that this car costs less than $40K, that’s the model we want to test. The only option our test car had was different wheels. 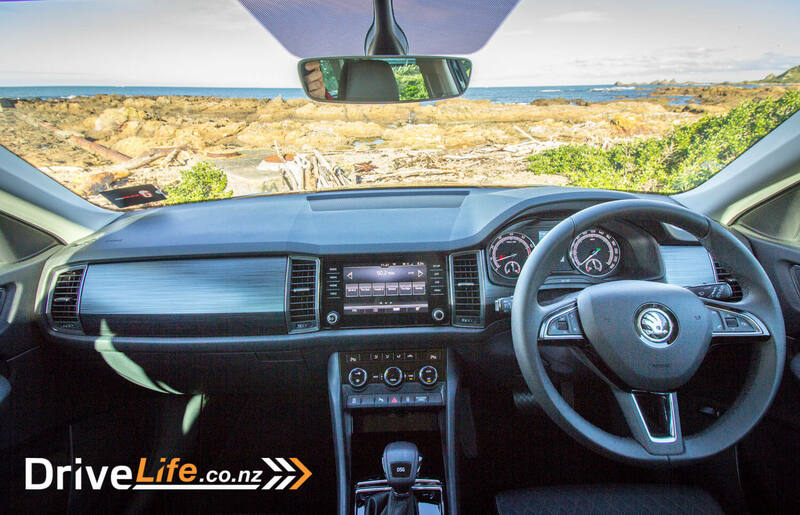 Is the Kodiaq a good alternative to the ‘other’ cheaper seven-seaters – the $40K Dodge Journey or Mitsubishi Outlander, or the $41K Holden Captiva? 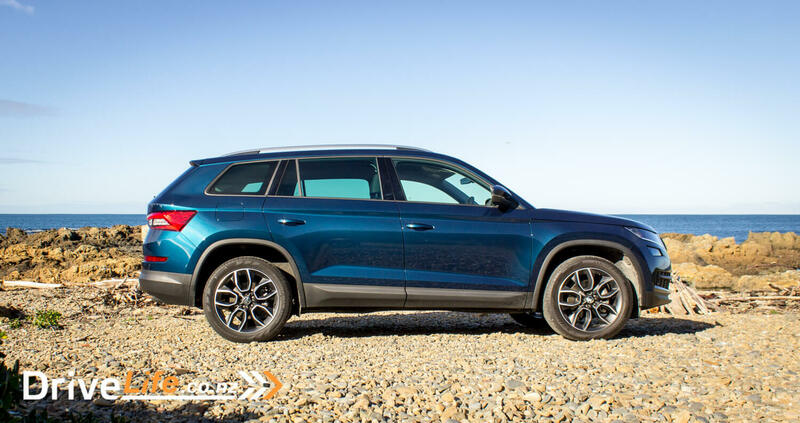 Currently you have four variants to choose from in the Kodiaq range, with more arriving in 2018. 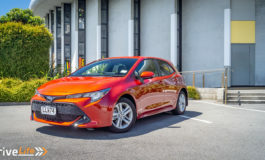 There’s the base Ambition model (tested), and is fitted with a 1.4-litre turbo petrol motor putting out 110Kw of power and 250Nm of torque. Next up is the $44,990 Ambition + which adds AWD and some goodies. 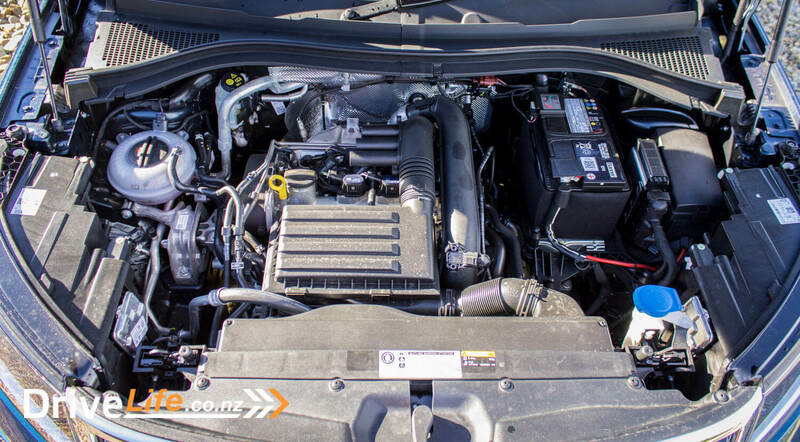 The top of the range is the AWD-only Style model, available with a 2.0-litre turbo petrol engine (132Kw/320Nm) at $54,290 or a 2.0-litre turbo-diesel (140Kw/400Nm) at $58,290. All are seven seaters and the two Ambition models have a 6-speed DSG gearbox while the Style models move to a 7-speed DSG. Even the Ambition model is well equipped for your $40K. Reversing camera, front and rear parking sensors, emergency braking, cruise control, electric tailgate, drowsiness detector, auto-dimming rear-view mirror, auto wipers, auto headlights, push-button starting, tyre pressure monitoring system, cornering lights, fog lights, DRLs, electrically folding and heated exterior mirrors, climate AC, and half-leather seats. Lots of items that are standard on the Style model is available as an option on the Ambition models, so you can pick and choose your options if you don’t want to go full on to the next model up. 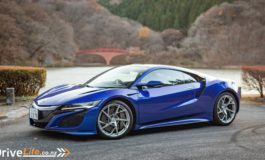 In saying that, there’s no comparison for value – you are better off going to the Style model as the savings are pretty massive against if you added the options separately. If you buy the Ambition +, on top of AWD you also get keyless access, triple-zone AC, full leather, heated front seats and SatNav. 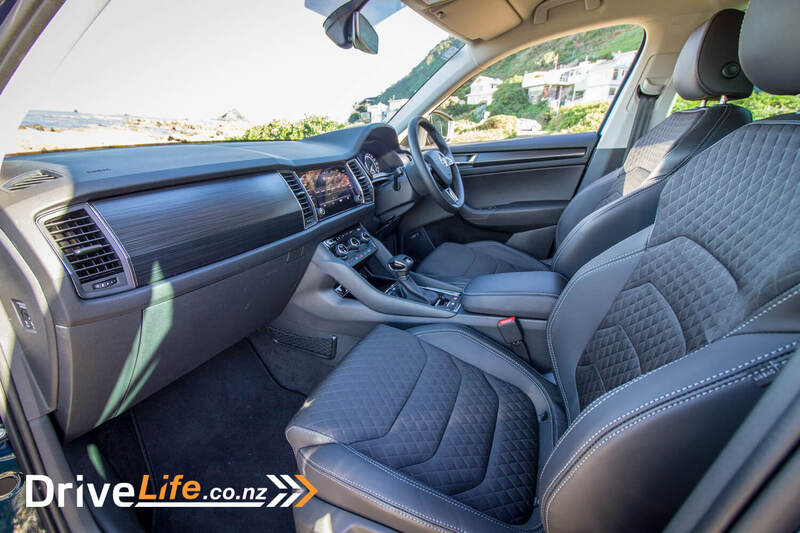 The Style goes all out to include Park Assist (automatic parking), adaptive cruise, lane assist and blind spot monitoring, a ‘virtual pedal’ for hands-free opening of the tailgate and a colour display for the driver. This is a nice looking SUV, and you can easily see the Skoda design touches. It looks like a Fabia that’s been pulled in all directions. Our test car, finished in Pacific Blue Uni, was elegant and looked like it was more expensive than its $40K price tag. With LED DRLs and some nicely integrated fog lights, she’s a well-designed car. The front looks like a cross between a Tiguan and a Grand Cherokee, but it works. It’s definitely not an in-your-face shape, and you can mix it up with the traffic without anyone looking at you. Lots of people may prefer this, to say a Mazda CX-9 which really stands out from the crowd. 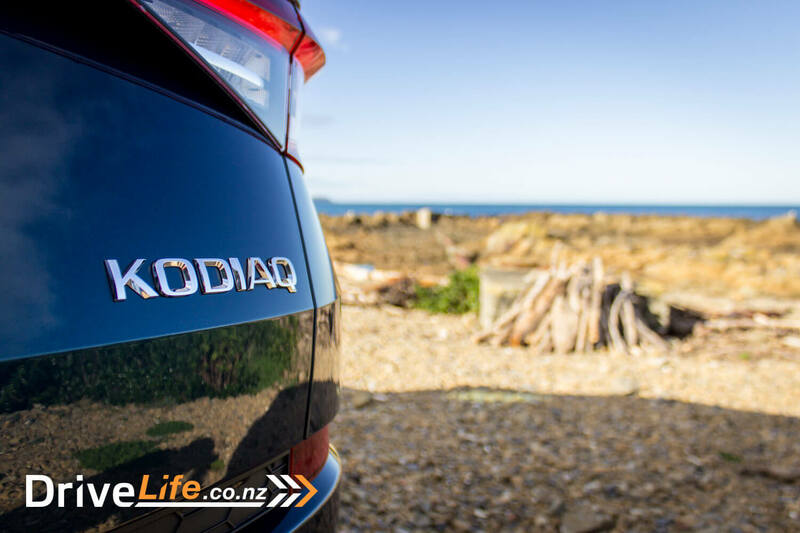 The Kodiaq is advertised as a full-size SUV, but it looks smaller and feels smaller than say a Prado or even a CX-9. Hard to say if this shape is going to date quickly, though. Time will tell. If you know Skodas, you’ll feel right at home. The dash looks very Skoda-ish, with a high-quality feel to most things. As you sit in the driver’s seat, the steering wheel feels nice – leather of course, and a great feel to it. The steering controls are standard Skoda and work so well for so few buttons. Not once did I have to look down while driving to check which button I was pushing. In saying that, cruise control is managed by the indicator stalk, but it’s pretty simple to use. One of the first things you notice though are the seats. Not leather in the base model, but a beautiful black cloth in a quilted design. Every passenger commented on this – they look fantastic. Not heated or electric in the base model, but almost preferable over leather. Comfy too – almost French-soft in comfort, front or rear. 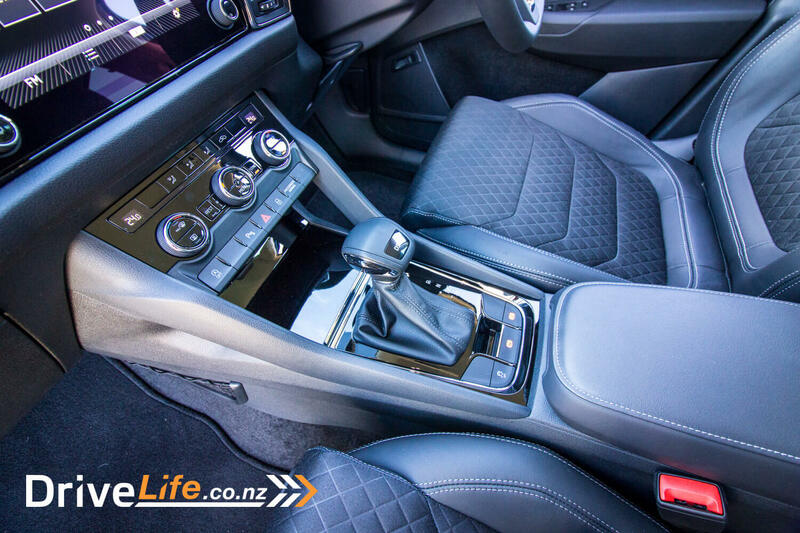 But – the seats are black, as is the dash, door panels, centre console – only the headlining and pillars are beige. I think a panoramic roof is much needed here, it’s pretty dark inside. Some plastics too are hard to the touch, but then I had to keep reminding myself this is the base model at $40K, so could be excused for some things like this. There are double gloveboxes and they are a good size, which is a pleasant change after a run of cars with almost tiny gloveboxes. There’s no SatNav in the Ambition model, but you do get Android Auto and Apple CarPlay, so no dramas there. You do get smallish drawers under both front seats, and other Skoda touches like umbrellas in a special compartment in the front doors. One upmarket touch is the carpeted compartments in the door panels, another one of those things that adds to the perception of quality. More goodies for buyers is the wireless cellphone charging mat (if your phone is compatible) and it also doubles as a signal booster, which is always welcome. 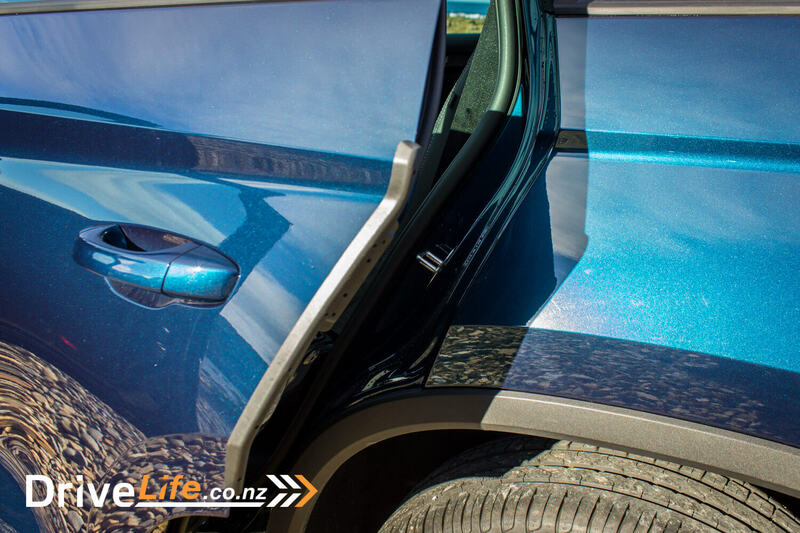 Another family-friendly addition is the pop-out plastic door edge guards. They work as advertised; open the door a little and out pop the guards to stop the kids crashing their doors on the next car over. It’s one of those things that you wonder why everyone doesn’t do it. 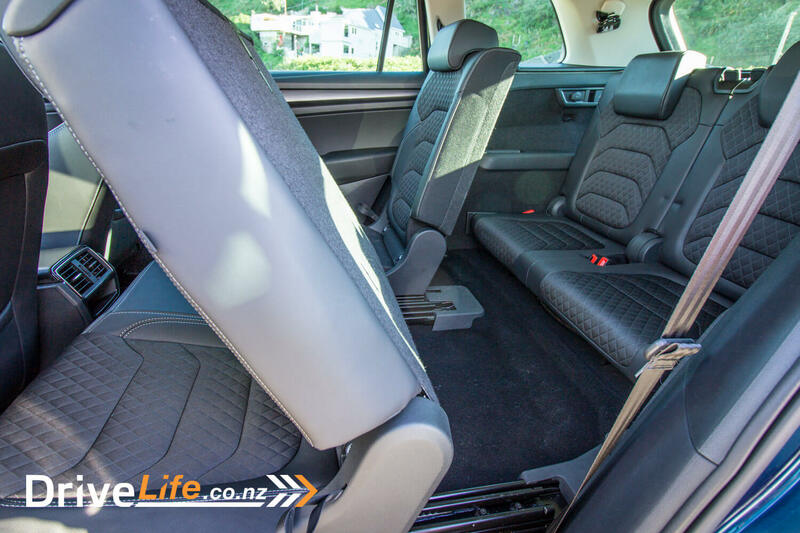 Middle-row passengers are well catered for, for room – plenty of leg and shoulder room back there. There’s a 12-volt socket, but no USB which surprised me, with the sales angle of a family car. So for Skoda’s first 7-seater – what’s the third row like? I put a couple of teenage girls back there, and while their legs weren’t quite up around their shoulders, it’s definitely made for smaller children, say under 10. I wouldn’t want a couple of teens back there for a really long trip. Access is a little narrow too, but about the same as a Mazda CX-9. In fact the space back there is about the same as the CX-9. One thing it has over the CX-9 is slightly better boot space – 270 litres with the third row up, compared to 230. 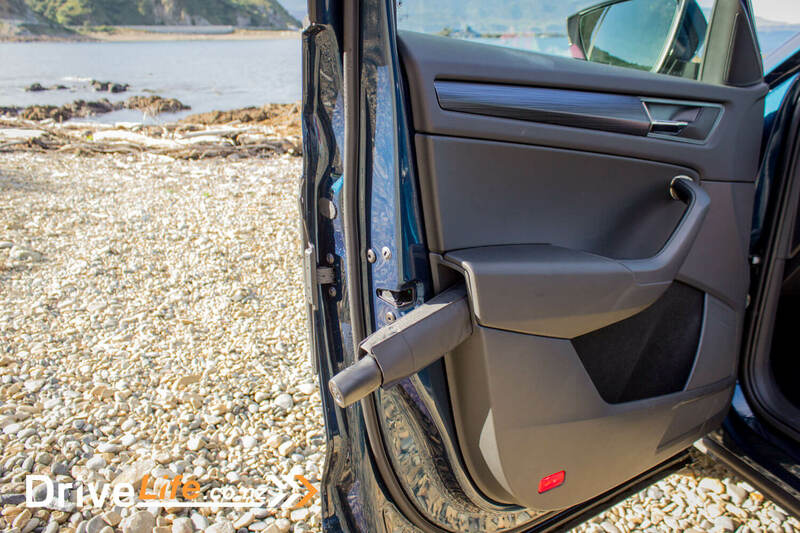 The electric tailgate is opened from the rear door, the driver’s door or the keyfob. 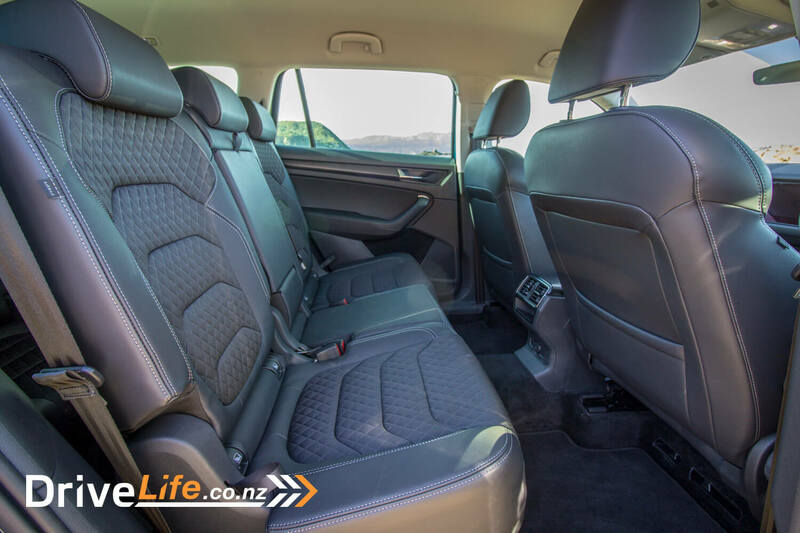 Over 2000 litres of space with the second and third seats folded down is pretty impressive, and a fair whack over the 1641 litres of the CX-9. 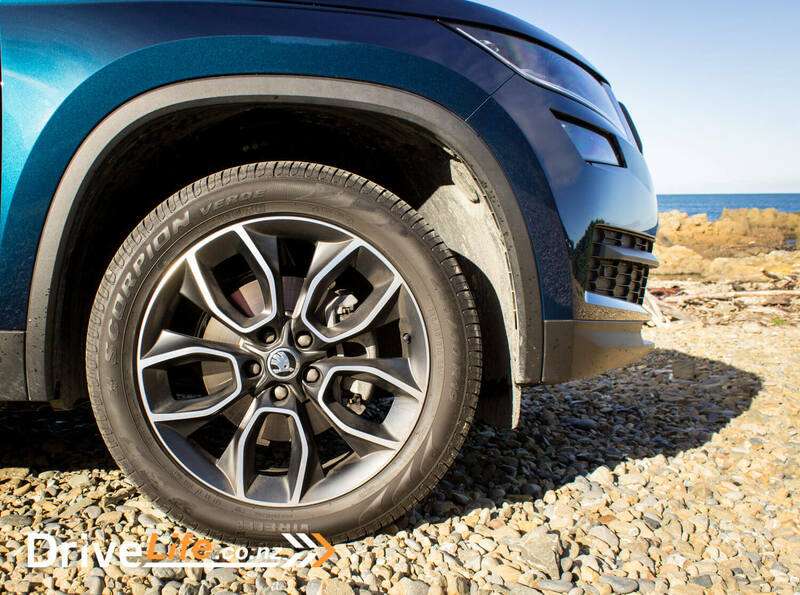 The Kodiaq is fitted with the latest version of Skoda’s media system, and it works just fine – you’ll have it figured out in minutes. The quality of the display needs mentioning – crystal clear and top class. Syncing my phone via Bluetooth was painless. Don’t get your hopes up too high for the audio system – it sounded a little flat sometimes, and I couldn’t adjust it any better. The volume was certainly there though, and you can crank up the bass to really have the door panels pumping. Get in and drive the Kodiaq, and you simply will not believe this thing runs a 1.4-litre petrol engine. It fair flies along, and wheel spin is a common occurrence. Sure, it’s a turbo – but this is a large, 7-seater SUV with a puny engine – it should not go this well. But oh, it does. Your passengers will need to be prepared to literally have their heads whipped back if you give it even a quarter throttle. It’s a joy to drive in this respect; slight turbo lag but then dollops of torque kick in and away you go. It’s a grin machine, especially when you remind yourself it’s just 1.4 litres of engine. In my notes, I wrote, “this car just wants to go”. It so does. The funny thing is the Kodiaq gets to 100 in 9.7 seconds, but feels so much faster. It’s probably more likely that its 0-50 time is quick, rather than the 100km/h time being outstanding for its class. There are a few downsides to this performance. 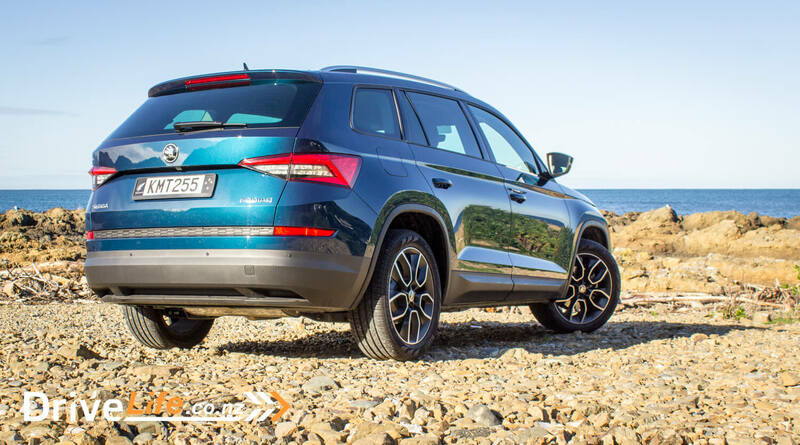 One was fuel economy; Skoda gives the Kodiaq a combined rating of 6.3/100km. Over 500km of driving on say 60% city/40% highway, I averaged 8.9l. That’s a hefty number for a 1.4 litre car. Still, I guess I did use that accelerator more than I should have, but most of the time I was quite content just tootling along; the Kodiaq is great at either. Another downside is the wheel spin. For my week with the car, it rained at least half the time and up any steep hills, if you jabbed the throttle a bit much there would be wheel spin. It started off as fun, then it got a bit tiring. In this respect it forces you to drive a bit more carefully to avoid this – but my fuel consumption didn’t reflect that. I think I’d stump up for the AWD model to avoid this. On the plus side, and weirdly for a 4-cylinder car, it has cylinder deactivation. Even doing 100km/h on the motorway will see the car cutting two cylinders out to save gas. And unlike other cars that do this, it is truly transparent – you have no idea unless you have the fuel economy gauge on the driver information display going, to tell you. Every other car I’ve driven with this feature has a thrum or weird vibration when cylinders are cut out. So running on two cylinders on the motorway and you wouldn’t know it. Not only that, but other than up those steep hills, the engine is very quiet. It’s never noisy, but while it’s no Mazda CX-9, gentle throttle openings or motorway driving see little engine noise. On that noise, wind noise too is extremely well controlled. 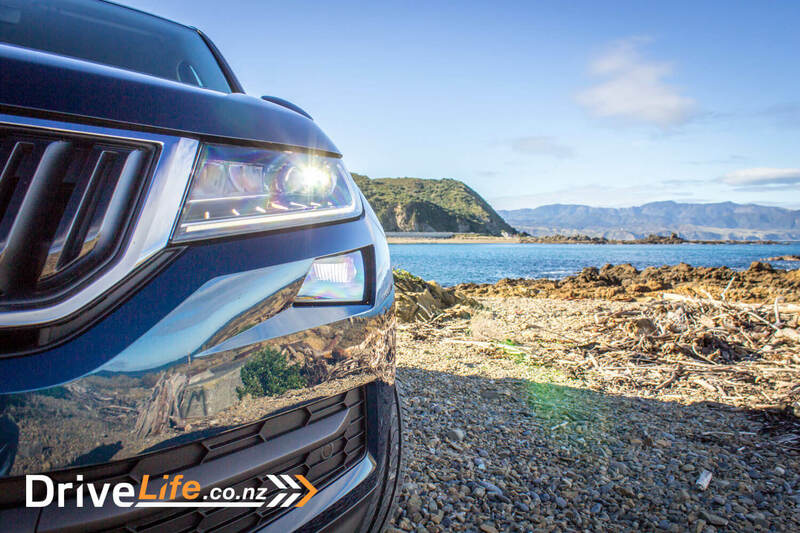 Day to day life with the Kodiaq is a mixture of really good, and not as good. One thing which I love is the engine auto-stop and brake auto-hold combo. Drive Life readers may remember me complaining (admitted) about engine auto-stop systems that don’t tie in properly with the electric park brake auto-hold feature. Most cars (almost all) have it so that when you have the auto-hold feature enabled and stop at the lights, the engine stops then you take your foot off the brake (as auto-hold is now on) and then the engine starts again. It’s just so pointless. Not so the Kodiaq; stop at the lights, engine stops, foot off the brake, engine stays stopped. Perfect. Not only that, but if you are anticipating the lights changing, you can give the gas a slight tap and the engine will start, but the brakes will stay on – also perfect. It’s an example of how to do it right. General visibility is pretty good, even though you don’t have blind spot protection in the base model, you can see everywhere you need to just fine. Grip from the Pirelli Scorpion tyres was excellent, and there is little tyre noise to be heard on any road surface. Thank you Skoda for fitting decent tyres. 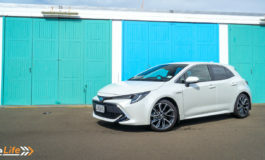 Handling is good for the class – not too much body roll at all, and the ride is excellent; Quiet, smooth – pretty much like the rest of the car. One Skoda feature that I enjoyed using was the voice projection to the rear seat passengers. It means that the car uses the microphone up front to send the driver’s voice to the back seat passengers – no more shouting. Mind you with the quietness of the car, this isn’t really necessary but it’s a handy feature I expect many will appreciate. You can adjust the level of amplification too, which is handy. I did find that when operating the interior light switches on the roof console there was always a physical clicking noise, and it took me a while to realise it was just this system pushing out the noise of me using the button to the rear speakers. I did say some things weren’t so good; the main one of these is the DSG transmission. On the whole, it’s excellent, but at low speeds – especially when moving off from cold – it’s a bit jerky. Low speed gear changes can be a little clunky. At times, the transmission seemed a little unsure of what gear to pick, say when accelerating at low speed out of a corner. These things, combined with the awesome performance, means I wouldn’t recommend the Kodiaq as a car for someone to learn to drive in. At times you have to concentrate to drive it smoothly at low speeds. A number of times I found it too easy to move the shifter left into Manual Mode when I meant to move it into park – it seemed a little too easy for it to glide left instead of up. Once I was aware I was doing this, I made sure I did it right next time. I’ve gone looking for base model, 7-seater SUVs here, 2WD unless stated. You can really see the value of the Kodiaq Ambition. I was surprised just how many 7-seater SUVs there are for sale. Skoda are really late to the party with the Kodiaq; most manufacturers have had a full-size SUV for a while now. Some are excellent drivers, some are well priced, and some handle very well. But here’s the thing: the Kodiaq combines all the good stuff in one car. It drives extremely well, it goes well, it’s quiet, spacious, well-built and the pricing is hard to beat for the equipment levels you get. You may have noticed I have compared the Kodiaq to the CX-9 a number of times; that’s because I see them as extremely similar cars. Both well designed, quiet and smooth and desirable. But the base CX-9 FWD is $13K over the base Kodiaq FWD. As much as I love the CX-9, that’s a huge gulf. It’s a shame the Kodiaq can be jerky at low speeds. But for an overall package, it doesn’t get much better than this.